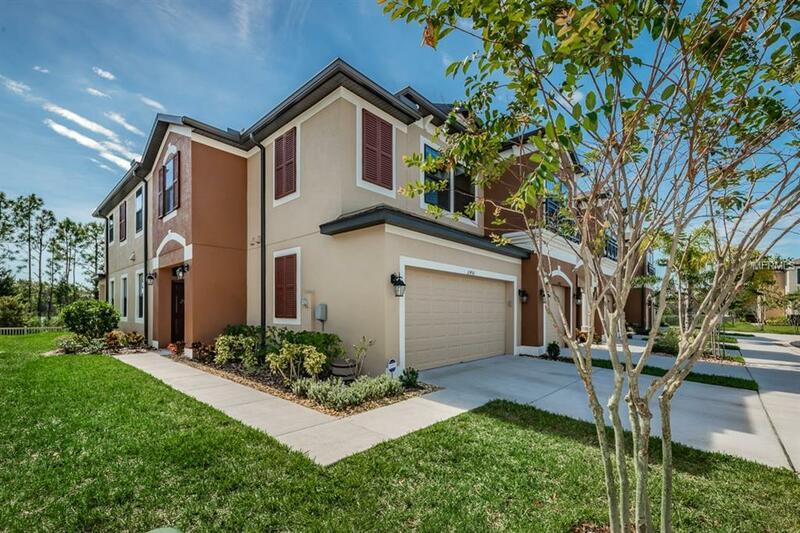 Absolutely stunning END UNIT TOWNHOME located in the Westchase area w/ peaceful WATERFRONT CONSERVATION views! This spacious home is immaculately maintained & shows like a model! No detail was spared when constructing this EFFICIENT ENERGY STAR RATED, 2200sqft, 3 bedroom, 2.5 bath, 2 car garage + BONUS ROOM! Featuring wood plank ceramic tile on the first floor & stunning hand scraped wood plank luxury vinyl flooring up the stairs & into the bonus room area. The downstairs wide open floor plan is perfect for gathering & entertaining! Spacious kitchen complete w/ large walk-in pantry, bright white solid wood shaker style cabinetry, 42" uppers, crown molding, quartz countertops, stainless steel appliances, french door refrigerator, glass subway tile & an OVERSIZED contrasting ISLAND! The master suite boasts beautiful water views, a large walk-in closet & stunning bathroom featuring an oversized shower, glass mosaic tile framing mirrors, custom cabinetry w/ extra storage & bank of drawers! Additional bedrooms w/ walk-in closets & Bonus Room also located on the 2nd floor. *15yr Structural Warranty* Enjoy the outdoors from your covered lanai(screen enclosure can be added w/ HOA approval), extended patio & tons of green space! West Lake Townhomes is a beautiful GATED community with a swimming pool & zoned for excellent public schools! Located just minutes from shopping, restaurants, Tampa International Airport, Downtown Tampa & world renowned white sand beaches. Become apart of this wonderful community today!